The Constitution Act, 1867 requires the election of the Speaker at the beginning of a Parliament and again any time a vacancy occurs. At the first sitting of a new Parliament, the Members assembled in the House are summoned to the Senate Chamber, where they are informed that the business of the new Parliament may not officially commence, nor the Throne Speech be read, until the House of Commons has elected a Speaker. The Members then return to the House and immediately proceed to elect a Speaker by secret ballot. With the exception of Ministers and party leaders, all Members are considered candidates for the position of Speaker unless they inform the Clerk of the House in writing, by 6:00 p.m. on the day prior to the election, that they do not wish to stand for the office. Prior to the election, the Members who are candidates may make introductory speeches of no more than five minutes. Following the speeches, the House suspends its proceedings for 30 minutes, after which the Members proceed to the election of the Speaker. The election is presided over by the “Dean of the House”, the Member with the longest unbroken record of service in the House, who is not a Cabinet Minister, party Leader, House Leader or Whip. 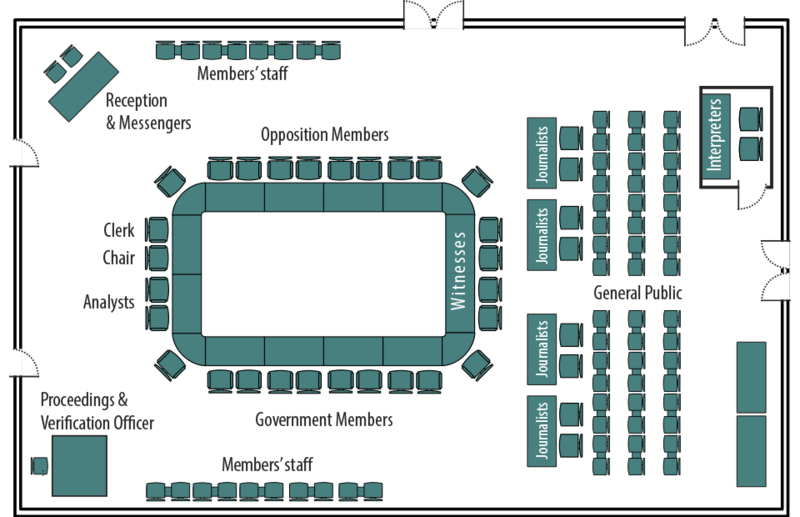 The election is conducted by secret ballot using voting booths placed on the Table in front of the Speaker’s chair. During the election, no debate is allowed, no motion is accepted, and no question of privilege may be raised. Members who wish to vote for a candidate for Speaker rank the candidates listed on the ballot by writing the number one (1) next to their first choice, the number two (2) next to their second choice, and so on until they have completed the ranking of any candidates they wish to vote for. Members are not required to rank all candidates on the ballot. Ballots assigned to the eliminated candidate(s) are recounted and added to the totals of the remaining candidates based on the next preference indicated on each ballot. This process is repeated until one candidate obtains an absolute majority of the votes, at which time the name of the successful candidate is announced to the House. If, after all other candidates have been eliminated, two or more candidates have an equal number of votes, the Clerk of the House prepares new ballots with only the names of the remaining candidates, in alphabetical order. The voting and counting process described above is repeated until a candidate obtains more than half of the votes cast. Once a Speaker has been elected, the Clerk of the House destroys all ballots and any record of the vote count. The Clerk cannot divulge the number of votes cast for any candidate. Once elected, the Speaker, escorted by the Prime Minister and the Leader of the Official Opposition, takes the Chair, thanks the Members for electing him or her and adjourns the House until the next day.